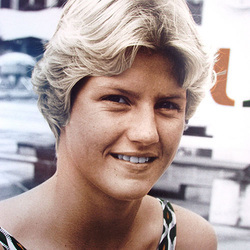 A standout swimmer at every level of her career, Melinda Lyverse ranks among the finest swimmers ever to compete for the University of Miami. Throughout her career, Lyverse earned a reputation as a superior stroke technician and a swimmer who excelled in the "big meets". When she completed her collegiate career in 1980, Lyverse had captured 18 All-American honors, third best in school history. An outstanding freestyle sprinter, Lyverse excelled as a member of Miami's standout relay teams from 1977-80. During her collegiate career, Lyverse helped 12 Miami relay squads earn All-American honors. In 1978, Lyverse garnered seven top-16 finishes at the national championships meet, including three individual finishes and four relay finishes. A seven-time All-American in individual events, Lyverse also garnered three top-12 finishes at the national meet in 1978. Her best individual performance was a third-place finish in the 200-yard freestyle as a freshman in 1977. Lyverse is married to former UM sports information director Karl Schmidt.